I often counsel my coaching clients to prepare three main points when they are trying to communicate something important. So, if I were to summarize my three main points for this entry they would be: 1) we are all on a path; 2) our intersection with beings (human, animal, plant) present opportunities for learning; 3) reaching out and creating those intersections increases our personal growth exponentially. So, I’ll start with my own epiphany tonight over dinner. I was thinking about the two horses I have in my pasture right now, exploring the two very different relationships, and wondering why it has been so hard to bond in a meaningful way with Casanova, my gregarious gelding. I summed it up as a fear of sorts. The energy I feel around Cas is paramount to the bottled-up energy of a rocket about to blast. The nervous energy he emits is unnerving to me. Shi-Annie, my old mare, on the other hand is just tired and happy to see someone coming because it might mean food is on the way. She and I have been through many years of riding. We started with the same kind of energetic friction that I have with Cas now, and have ended up with a beautiful bond and a mutual “understanding”. At first, I was on the ground more than I was on her… She was the horse that taught me how to ride a buck. 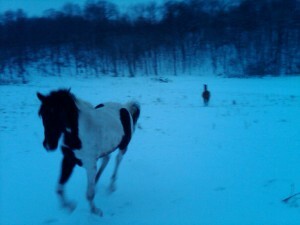 In fact, Shi came bucking into my life at a time when my life was bucking me. I was divorced, had just entered “empty-nest” syndrome, and was faced with the reality that life wasn’t necessarily “plan-able”. Shi came into my life just prior to some extremely difficult life-bucks, and I believe that her lesson for me was to accept the fact that a) life throws serious bucks; b) sometimes you can hang on and sometimes you fall; and c) no matter what, when life sends you a buck you better get back on, or you will never be “boss” of your own life. Shi doesn’t buck so much anymore. Once I learned to get back on, she let go of the need to get me off her back… it was just wasted energy. We are now good friends. When we ride, it feels as though we are one. We have a connection that takes time to build… and she is one of my greatest teachers. You don’t have to be on a horse’s back to start to learn from their innate wisdom. In fact, my clients don’t ride the horses; they experience the learning on the ground. We can learn from the horse simply by being one of the herd for a moment. In fact, it’s the best way to connect with our inner wisdom and creativity. To simply “be” with the herd, is powerful and transformational. To let go of all else and to be with these 1200-pound, powerful, present beings can be pivotal in our path to self-mastery because we have to surrender our ego and be our genuine selves to be “with” horses. Tonight, perplexed about the difference in my relationship with Shi and Casanova, I had a true Oprah “light-bulb-moment”. Casanova, with all his abundant energy, curiosity and enthusiasm, represented to me that unbridled passionate beckoning of all that is out there to grab. 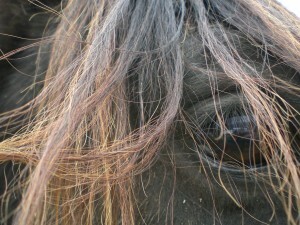 He is the kind of horse that looks at something new with anxious curiosity instead of fear. Horses are often extremely fearful of anything new in their environment – they are “flight” animals; this is one of their most important survival strengths. Even though humans are naturally pack animals, or “fight” animals, we still have flight instincts like the horse when something is new and frightening. Think about the first time you tried anything scary. Many of us feel like running away from things that make us uncomfortable. One of the things that immediately endeared me to Casanova was his curious nature. He has always been curious first and scared last–an admirable trait. When he was a two-year-old, at 900 lbs, it was cute. However, as he has grown into a good-sized, 1300 lb horse, his confidence can be… intimidating; his energy can feel… overpowering. How many times have we been afraid of something that feels intimidating or overpowering? What can we learn from Casanova? And most importantly, what does Casanova represent? To me, Casanova represents abundance — abundance of life-force, creativity, enthusiasm, and energy. He is unbridled openness. He represents the release of all caution, old rules and limitations; and I believe that if I can open to him and build an “understanding” with him as I did with Shi, I will not only be able to handle life’s bucking, but I will open to the infinite abundance that is there for the taking. I will have boundless energy to ride, and sheer expansiveness to explore. I think that with Casanova, I can reach infinity. So, how do we learn from our equine friends? We just be with them. Let them speak to us. 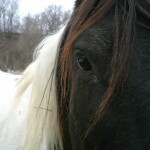 Use a few coaching tools with the power of horse wisdom to lead us to our truth. Let the horse show the way to the creative, powerful, leader within. 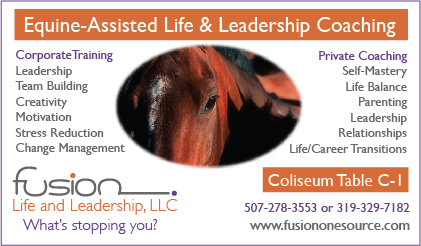 See you at the MN Horse Expo in April!